BOREDOM during the summer holidays was the catalyst for Lesmurdie teen Kai Lovel’s online apparel business The Tech Thread Co. 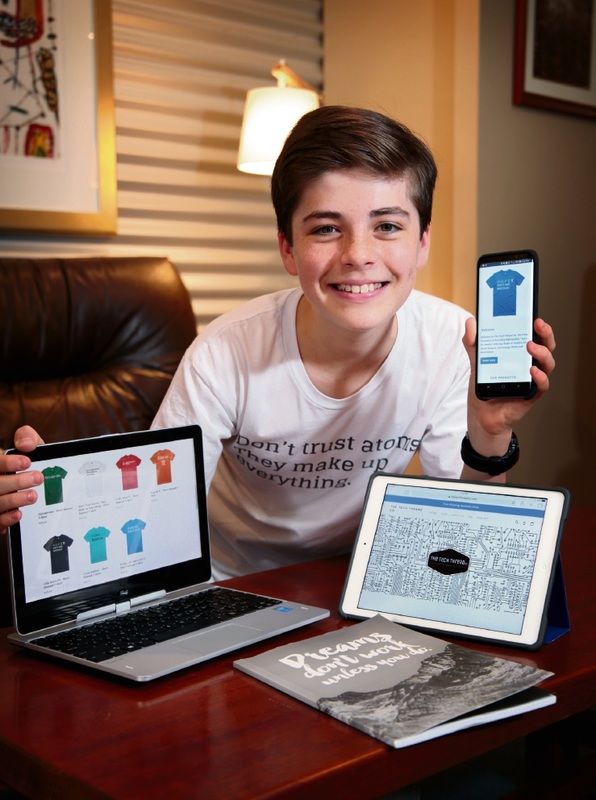 Combining his passion for technology, science and graphic design, the Mazenod College Year 8 student now develops T-shirts for likeminded folk. “Our products are aimed at those whose inner-geek needs a T-shirt to share their passion with any passersby,” Kai said. “The business is still in its early stages and I’m loving the development of our marketing strategies, content and products to build the brand. He said it had taken commitment and determination to get the business ready to launch. “I was exploring the potential of ecommerce websites like Shopify and realised that I could actually take this somewhere,” Kai said. “(It took) lots of research, patience and negotiating extra computer time with mum. At just 13, he said he has had to juggle his school, social and work commitments and aims to make a positive difference where he can, hoping to help others drive their own ventures. “I feel really strongly about so many causes and having an audience to do something about it is definitely the direction I want to take,” he said.